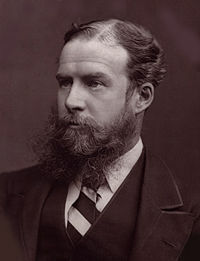 Sir John Lubbock, 4th Baronet, 1st Baron Avebury, PC FRS (April 30, 1834 – May 28, 1913), English banker, politician, biologist and archaeologist was born the son of Sir John William Lubbock, Bart. Known as Sir John Lubbock, 4th Baronet from 1865 until 1900, when he received the title Baron Avebury, he was a polymath. He began his working life as a banker working with his family's company, served as a Member of Parliament for many years, and was also involved with entomology, botany, biology, archaeology, and ethnology. He became famous among the general public in Britain when he introduced the Act that established the dates of Bank Holidays. In the academic sphere, he helped establish archaeology as a scientific discipline, coining the terms Paleolithic and Neolithic and contributing to the preservation of the Avebury site, as well as publishing books and articles on topics as diverse as wild flowers, the behavior of insects, the intelligence of animals, and the origin of human civilization. He was also influential in nineteenth-century debates concerning evolutionary theory, having made friends with Charles Darwin at a young age. Sir John Lubbock accomplished much in his life, using his abilities not just to serve his own interests and to advance knowledge but also to improve the the lives of ordinary people and to preserve ancient monuments that link us to our past. John Lubbock was born on April 30, 1834, the son of Sir John Lubbock, 3rd Baronet, a wealthy London banker, and Harriet Hotham. He was brought up in the family home of High Elms Estate, near Downe in Kent. He remained in Downe except for a brief period from 1861–1865, when he relocated to Chislehurst. Lubbock had seven brothers and one sister; three brothers, Alfred, Nevile and Edgar played cricket for Kent. Edgar and Alfred also played football and played together for Old Etonians in the 1875 FA Cup Final. During 1842 his father brought home a "great piece of news": the young Lubbock said later that he initially thought that the news might be of a new pony, and was disappointed to learn it was only that Charles Darwin was moving to Down House in the village. The young Lubbock was soon a frequent visitor to Down House, and became the closest of Darwin's younger friends. Their relationship stimulated young Lubbock's passion for science and evolutionary theory. Darwin rented ground, originally from Lubbock's father, for the Sandwalk wood where he performed his daily exercise, and in 1874 agreed with Lubbock to exchange the land for a piece of pasture in Darwin's property. When Darwin died in 1882, Lubbock suggested the honor of burial in Westminster Abbey, organizing a letter to the Dean to arrange this, and was one of the pallbearers. Both father and son were influenced by Darwin's scientific interest in nature and developed the grounds of the High Elms estate, including planting trees from all over the world as well as constructing terraced gardens which remain to this day. In 1845, Lubbock began studies at Eton College, and after graduation was employed by his father's bank (which later amalgamated with Coutts & Co), where he became a partner at the age of twenty-two. In 1956, he married Ellen Frances Horden. They had six children: three sons, the eldest of whom, John, became the Second Baron Avebury, and three daughters. During the 1860s he held a number of influential academic positions, including President of the Ethnological Society from 1864-1865 and President of the International Association for Prehistoric Archaeology in 1868. In 1865, upon his father's death, he succeeded to the baronetcy, becoming Sir John Lubbock, 4th Baronet. In 1870, and again in 1874, Lubbock was elected as a Liberal Party Member of Parliament (MP) for Maidstone. He lost the seat at the election of 1880, but was at once elected member for the University of London, of which he had been vice-chancellor since 1872. He carried numerous enactments in parliament, including the Bank Holidays Act of 1871 and the Ancient Monuments Act of 1882. When the Liberals split in 1886 over Irish Home Rule, Lubbock joined the breakaway Liberal Unionist Party. His wife Ellen died in 1879. Five years later he married Alice Lane Fox-Pitt, the daughter of Lieutenant-General Augustus Henry Lane Fox Pitt Rivers. They had five more children: three sons and two daughters. 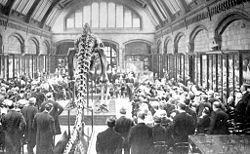 In 1881 Lubbock served as president of the British Association for the Advancement of Science, and from 1881 to 1886 as president of the Linnean Society of London. He received honorary Doctor of Law degrees from the universities of Oxford, Cambridge (where he was Rede lecturer in 1886), Edinburgh, Dublin, and St Andrews. In January 1900 he was promoted to the peerage as Baron Avebury, his title commemorating Avebury, the largest Stone Age site in Britain, which he had helped to preserve (he had purchased it in 1871 when the site was threatened with destruction). 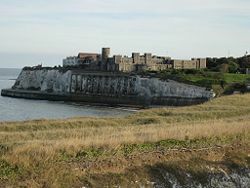 Lubbock died from heart failure at Kingsgate Castle Kent, a property he had restored, on May 28, 1913 at age 79. Lubbock was a polymath with interests and successful careers in banking, politics, and in scientific fields ranging from archaeology to zoology. Lubbock began his banking career on completion of his studies at Eton being employed by his father's bank. He became a partner there at the age of twenty-two. He was elected the first president of the Institute of Bankers in 1879. In March 1883 he joined with other bankers to found the Bank Clerks Orphanage for the children of bank clerks who were deceased or ill, which developed into the Bank Workers Charity for bank employees, past and present and their dependents. As a Member of Parliament and as a banker had taken a close interest in gold coinage, Lubbock was appointed chairman of the committee on the design of new coinage in 1891. After the early 1870s, Lubbock became increasingly interested in political advocacy, business, and natural science. As liberal MP for Maidstone, Kent, Lubbock had a distinguished political career, with four main political agendas: promotion of the study of science in primary and secondary schools; the national debt, free trade, and related economic issues; protection of ancient monuments; securing of additional holidays and shorter working hours for the working classes. He was successful with numerous enactments in parliament, including the Bank Holidays Act 1871 and the Ancient Monuments Act of 1882, along with another 28 acts of Parliament. Prior to 1834, the Bank of England observed about thirty-three saints' days and religious festivals as holidays, but in 1834, this was reduced to just four: May Day, All Saints Day, Good Friday, and Christmas Day. In 1871, the first legislation relating to bank holidays was passed when Lubbock introduced the Bank Holidays Act to specify the holidays. In gratitude and bringing "a sense of medieval merriment," the English people called those first Bank Holidays St Lubbock's Days for a while. The Act designated four Bank Holidays in England, Wales, and Ireland (Easter Monday; Whit Monday; First Monday in August; Boxing Day in England and Wales and St Stephen's Day in Ireland), and five in Scotland (New Year's Day; Good Friday; First Monday in May; First Monday in August; Christmas Day). In England, Wales, and Ireland, Good Friday and Christmas Day were considered traditional days of rest (as were Sundays) and therefore it was felt unnecessary to include them in the Act. The 1871 Act was repealed 100 years later and its provisions incorporated into the Banking and Financial Dealings Act 1971. In January 1884 Lubbock founded the Proportional Representation Society, a political pressure group to promote electoral reform and in particular the use of the Single Transferable Vote (STV) in general elections. STV is a voting system based on proportional representation and preferential voting. The founding members included academics, barristers, and an equal number of Conservative and Liberal MPs. The society later become the Electoral Reform Society and continues to operate to this day. From 1888 to 1892 Lubbock served as president of the London Chamber of Commerce; from 1889 to 1890 as vice-chairman, and from 1890 to 1892 as chairman of the London County Council. Lubbock took a keen interest in evolutionary theory from a relatively young age. He had extensive correspondence with Charles Darwin, who lived nearby in Downe, and with whom he was close friends. Lubbock spoke in support of the evolutionist Thomas Henry Huxley at the famous 1860 Oxford evolution debate. During the 1860s, he published many articles in which he used archaeological evidence to support Darwin's theory. In 1864, he became one of the founding members (along with Huxley and others) of the elite X Club, a dining club composed of nine gentlemen to promote the theories of natural selection and academic liberalism. In 1865 Lubbock published what was possibly the most influential archaeological text book of the nineteenth century, Pre-Historic Times, as Illustrated by Ancient Remains and the Manners and Customs of Modern Savages. This became a standard archaeology textbook for the remainder of the century, with the seventh and final edition published in 1913. The book was based on his research visiting archaeological sites in Europe where he collected artifacts such as flint handaxes. His analysis of such tools led him to believe that the Stone Age was divided. He invented the terms Palaeolithic (from Greek παλαιός, palaios, "old"; and λίθος, lithos, "stone," literally meaning "old age of the stone" or "Old Stone Age") and Neolithic (from the Greek νεολιθικός, neolithikos, from νέος neos, "new" + λίθος lithos, "stone," "New Stone Age") to denote the Old and New Stone Ages respectively; his terms continue to be used today. Lubbock also collected objects through his contacts in countries ranging from Africa to Australia to North America. Through study of these objects, which included items such as boomerangs from Australia and tribal weapons from Africa, he studied the lifestyles of this variety of cultures with the aim of understanding prehistoric societies. While this method might not be acceptable today, such "armchair" ethnography was not uncommon in his time. Similarly, in those days researchers assumed that study of contemporary "primitive" societies would reveal much that was true about prehistoric societies. Lubbock published his second book, On the Origin of Civilization, in 1870. Notably, he introduced a Darwinian-type theory of human nature and development. "What was new was Lubbock's... insistence that, as a result of natural selection, human groups had become different from each other, not only culturally, but also in their biological capacities to utilize culture." During the early 1870s, he held the position of President of the Royal Anthropological Society from 1871–73, as well as the position of Vice President of the Royal Society in 1871. During this period he worked with John Evans, the other key figure in the establishment of the discipline of archaeology. In 1871, he purchased part of the Avebury estate to protect its prehistoric stone monuments from impending destruction. By this time the majority of the Neolithic standing stones had gone, having been either buried by pious locals in the fourteenth century or broken and taken for building materials. Meanwhile, the population of Avebury village was rapidly increasing, leading to further housing being built inside the henge. In an attempt to prevent further construction on the site, Lubbock purchased much of the available land in the monument, and encouraged other buyers to build their houses outside rather than within the henge. In 1882, he introduced the Ancient Monuments Protection Act which recognized the need for governmental administration on the protection of ancient monuments. Lubbock was also an amateur biologist of some distinction, writing books on hymenoptera (Ants, Bees, And Wasps: A Record Of Observations On The Habits Of The Social Hymenoptera), on insect sense organs and development, on the intelligence of animals, as well as other natural history topics. Among his discoveries were the fact that ants were sensitive to the ultraviolet range of the electromagnetic spectrum. Lubbock's archaeological work had great impact on the academic world. His Pre-historic Times was used as the standard textbook for decades. His terms Paleolithic and Neolithic, which he coined to describe the Old Stone Age and New Stone Age respectively, continue to be used to this day. Lubbock's impact was not just theoretical. He was instrumental in preserving the magnificent megalithic monument and henge at Avebury. His purchase of much of the land prevented further destruction of the stones as well as development of the land. After Lubbock's death, his widow sold the land and buildings to Alexander Keiller, heir to the Dundee marmalade business, James Keiller & Sons. Keillor began excavations at Avebury and re-erected many of the fallen stones, and marked the sites of missing stones. In 1943, Keiller sold his holdings in Avebury to the National Trust, which has preserved the monument as one of the best known prehistoric sites in Britain today. The peerage which was created for Lubbock in recognition of his work at Avebury, as of 2010 is held by Eric Lubbock, 4th Baron Avebury (b. 1928), who succeeded in 1971. He is the son of Hon. Maurice Fox Pitt Lubbock, sixth son of Sir John Lubbock, the first Baron. Lord Avebury is a Liberal Democrat and one of the ninety elected hereditary peers that remain in the House of Lords after the passing of the House of Lords Act 1999. The heir apparent is the present holder's son the Hon. Lyulph Ambrose Jonathan Lubbock (b. 1954). The quotation, "We may sit in our library and yet be in all quarters of the earth," is widely attributed to Lubbock. This variation appears in his book The Pleasures of Life: "Not only does a library contain 'infinite riches in a little room,' but we may sit at home and yet be in all quarters of the earth." ↑ Sir John William Lubbock, 3rd Bt. The Peerage.com Retrieved September 20, 2011. ↑ Alfred Lubbock. Cricket Archive. Retrieved September 20, 2011. ↑ Nevile Lubbock. Cricket Archive. Retrieved September 20, 2011. ↑ Edgar Lubbock. Cricket Archive. Retrieved September 20, 2011. ↑ O.J.R. Howarth and E.K. Howarth, A history of Darwin's parish: Downe, Kent (1933), 72–73. Retrieved September 20, 2011. ↑ 6.0 6.1 R.B. Freeman, Charles Darwin: A Companion (Dawson Publishing, 1979, ISBN 978-0712909013), 192. Retrieved September 20, 2011. ↑ 7.0 7.1 7.2 7.3 7.4 Steven Mithen, After the Ice: A Global Human History 20,000-5000 B.C.E. (Cambridge, MA: Harvard University Press, 2006, ISBN 978-0674019997). ↑ R.B. Freeman, Charles Darwin: A Companion (Dawson Publishing, 1979, ISBN 978-0712909013), 125. Retrieved September 20, 2011. ↑ Our history The Bank Workers Charity. Retrieved September 21, 2011. ↑ Christopher Edgar Challis (ed. ), A New history of the Royal Mint (Cambridge University Press, 1992, ISBN 978-0521240260), 536. ↑ Michael Olmert, Milton's Teeth and Ovid's Umbrella: Curiouser & Curiouser Adventures in History (New York, NY: Touchstone, 1996, ISBN 978-0684801643), 170. ↑ Bank Holiday Fact File Trades Union Congress, May 22, 2007. Retrieved September 21, 2011. ↑ Bruce G. Trigger, A History of Archaeological Thought (Cambridge: Cambridge University Press, 2006, ISBN 978-0521840767), 173. ↑ Aubrey Burl, Prehistoric Avebury (New Haven, CT: Yale University Press, 1979, ISBN 978-0300023688). 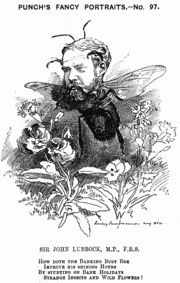 ↑ John Lubbock, "Observations on ants, bees, and wasps. IX. Color of flowers as an attraction to bees: Experiments and considerations thereon" J. Linn. Soc. Lond. (Zool.) 16 1881):110–112. History of "John Lubbock, 1st Baron Avebury"
This page was last modified on 18 May 2018, at 20:04.